Dallas Video by IEBA Communications | Shooting corporate video for the American Heart Association, Dallas. Shooting corporate video for the American Heart Association, Dallas. Anthony had already worked for The American Heart Association before coming down to Dallas, so when he did arrive here, he was happy to help out again with their “Go Red For Women” campaign. Anthony shot two days of HD as six women prepared and began a 6-month fitness program to promote heart healthy awareness among women. Four of them were selected to actively blog about their odyssey. 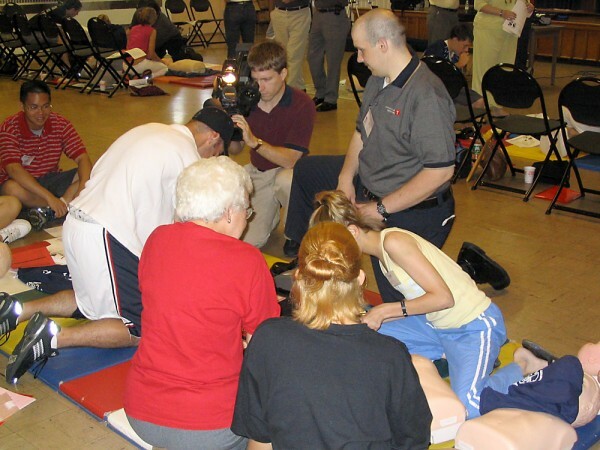 Anthony’s previous work was also over several days, as the American Heart Association tested the effectiveness of corporate video training materials for CPR training. Interested volunteers watched the training videos and then they were tasked to perform CPR with certified trainers standing by to watch their execution. This allows the trainers to assess whether video could be used- by itself- to train CPR in lieu of the physical presence of a certified CPR trainer. One of the groups performing CPR while a trainer watches. Click for larger image. Anthony taped multiple groups over the course of the training and the material he shot proved invaluable in the AHA’s decision that the presence of certified trainers continues to be required even with the usage of video training materials. 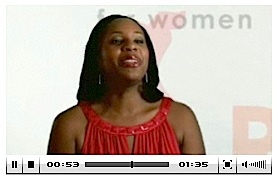 With the Go Red For Women campaign, you can see some of the video online. Here’s an image from Stacey’s interview. These interviews were videotaped in a small conference room that had been cleared of tables and chairs, but was quite reflective for audio. Anthony did not provide audio, nor the post (green screen) on these— maybe next time. He looks forward to seeing how these women progress through their program. Stacey's video (image color corrected). Click to go to site. The B4-Cage for using ENG lenses on DSLRs. IEBA helps North Texas GALA tell their story. RaceTrack picks IEBA for 100th store celebration! Using inexpensive “DJ” LED lights for video productions.